one of an edition of six. Aluminum and painted resin on wood. Provenance: Charles J Penney Collection New York. Sensitive and distinctive, Hubert Dalwood’s work was chosen for display at the 1962 Venice Biennale and he was soon in league with the leading post-war British sculptors of his time. After working as an engineer in the Royal Navy during the Second World War, Hubert Dalwood studied at Bath Academy of Art and was then awarded the Gregory Fellowship at Leeds University. His work of 1959, Large Object, won the John Moore’s prize in 1959 and is now in the collection of Tate Britain.. In 1974 he was appointed Head of Sculpture at the Central School of Arts and Crafts and died two years later. A retrospective of his work was shown by the Arts Council of Great Britain. With regard to the 'Temple sculptures' Norbet Lynton writes.....'Our first chance to see it outside the studio came with the 1966 open-air sculpture exhibition in Battersea Park. Dalwood showed there – in an exhibition much more vigorously selected (by Alan Bowness) than its six predecessors – one large piece, Mirage I. 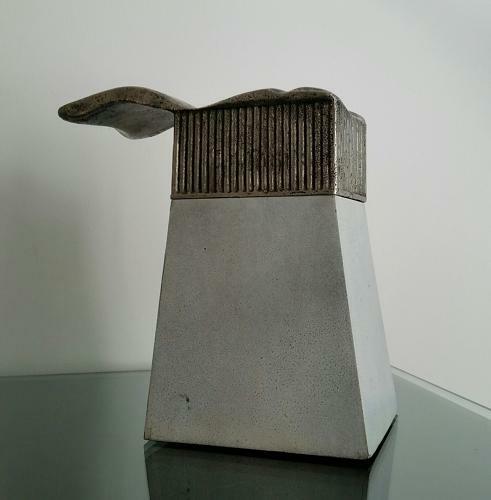 We were confronted by a metal object set atop a large, square, white-faced box with sloping sides that kept us at a psychological distance; only at what was obviously the back of the sculpture was the plane of the box vertical, and the aluminium thing on top too looked as though it had been sliced off on the same plane. One was not certain whether to read the white base as part of the sculpture or as its setting. The sculptured thing on top was in aluminium as we’d come to expect, but it was not modelled. To be exact, what we saw first was not modelled: close on a hundred aluminium columnar shafts, standing in two detachments three abreast and suggesting, more than anything else, a classical temple. But inside the temple space, set back some way from the front but very much sliced off at the far end, was a modelled, soft shape: a sight of landscape through the temple? The columns and the soft form mirrored themselves, top to bottom; this was obvious in the soft form, whereas one thought of the columns at first as being waisted half-way up. Between the box top and the columns came a stepped stylobate, relatively large in scale for the columns but effectively scaled to set off the temple from the base. When Dalwood showed again at Gimpel’s in 1967, the catalogue included a photograph of Mirage I but the piece was too large to be shown in the gallery. But it clearly was not a sport in the sculptor’s output. The whole gallery was full – rather too full, I recall – of sculpture made largely of columns, with or without modelled elements and ranging in dimensions from 76 inches to 8 inches. Clearly all this sculpture was about some-thing, and what it was about was not a simple physical fact but a vision – a complex of experience and reflections upon those experiences, of surprise and surprise recollected, of objects and environments outside the artist but encompassed and transformed by him by virtue of an intense interest in them as phenomena'.